A hero in the West Oakland streets, artist and entrepreneur J. Stalin is an expert conceptual thinker, consistently finding creative ways to illustrate his life on the street. Teaming up with a fellow Bay Area icon, taste-making DJ and producer DJ Fresh, Stalin announces Miracle & Nightmare on 10th Street Part 2, an upcoming double album. 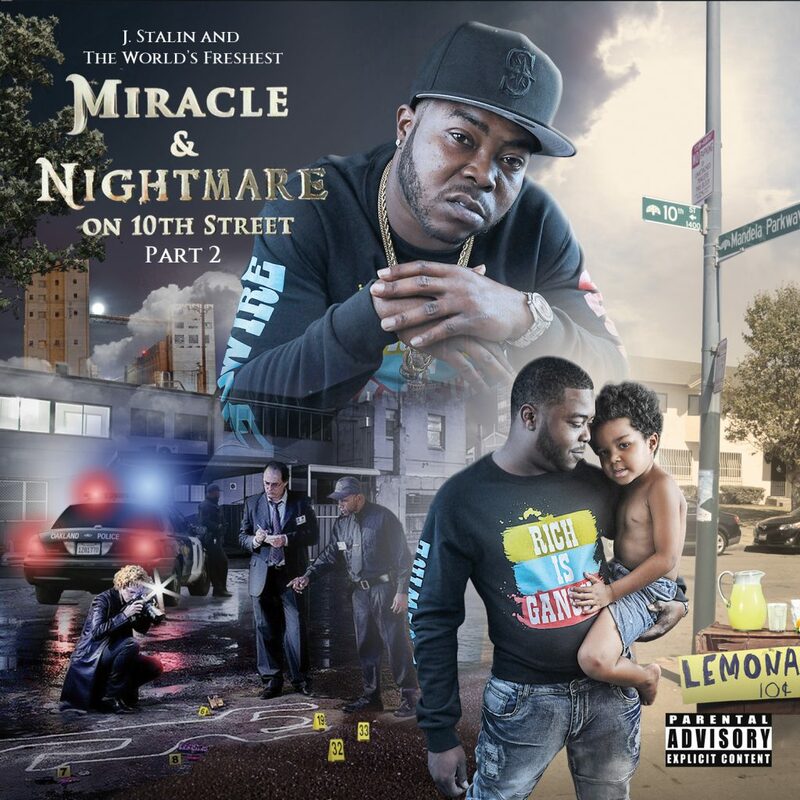 The sequel to Fresh and Stalin’s 2013 album Miracle & Nightmare on 10th Street, Part 2 spans two 10-track discs, each organized on the the nightmare and miracle of life in Stalin’s neighborhood in Oaktown. Packed with detailed street stories, creative brags and threats, and memorable turns-of-phrase, Miracle & Nightmare on 10th Street Part 2 brims with electricity, as DJ Fresh provides a bright electro-funk backdrop for the Miracle disc and an aggressive, bass-heavy mob soundscape for the Nightmare disc. The upcoming album boasts a quintessentially Bay Area guestlist, with appearances from Beeda Weeda, Shady Nate, Juneonnabeat, Mitchy Slick, and other East Bay stalwarts. The follow-up to Stalin’s 2017 album Gas Nation 2, and following DJ Fresh’s 2018 collaborations with Rydah J Klyde, Jay Worthy, and Zion I, Miracle & Nightmare on 10th Street releases on November 16th via EMPIRE. To accompany the announcement of the mixtape, Stalin shares “Nightmare on 10th Street Returns,” the first single from the upcoming project, just in time for Halloween. Opening up with a lengthy instrumental passage, marked by foreboding synth sparkles and squelching bass, “Nightmare on 10th Street Returns” describes the often-horrifying conditions of Stalin’s home neighborhood and the confrontational attitude he developed to survive: “There’s murderers in the hood, I ain’t talkin’ Freddy Kruegers/B*tch n****s, y’all remind me of the Three Stooges.” Premiered by HipHopDX, “Nightmare on 10th Street Returns” shows off the high-definition production typical of a DJ Fresh release, rife with detail and bursting with rhythmic invention. Please contact Michelle or Erin if interested in talking with J Stalin.